Olga's mom Maria was receiving calls all day long from people who enjoyed the party. Olga's cousin Masha was relaxing and then travelling back to Moscow. Katya is studying the technology of book editing in University. Natasha has been studying English and working on conversational dialogs - and experimenting with a spy kit. Ira and Maxim have mostly finished construction of their dacha halfway to Finland - and they made us sushi! 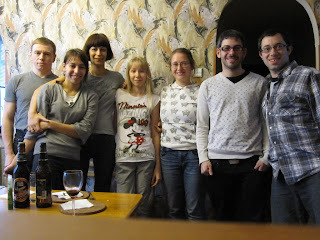 Ira's parents Anna cooked and Vladimir ate pieroshki (the cabbage was my favorite - along with the apple pie) - their use of Western languages is impressive - I kept doing a double-take when they would say such things as "stand up" and "more tea" peppered within conversation. Cousin Paul's girlfriend Annita was studying for exams.